Motivation is a fickle thing. One minute, you’re inspired to go and test your own brute strength after repeated viewings of Lindsey Vonn doing crunches during her Olympics interstitials. The next minute you’re at home eating and hate-watching reality television, self-avowing to hit the gym the next day. This is where Aaptiv comes in. Aaptiv is an audio fitness application which aims to adapt to your lifestyle with a completely unique experience suited to your various fitness needs. Whether you’re off doing a morning run and pounding it out at the gym or simply keeping it mellow with some yoga or meditation, Aaptiv allows you to do it all with an array of professional personal trainers and energy-boosting music to choose from. 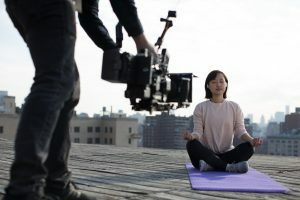 Recently, the Atlantic crew helped out with a promotional video for Aaptiv right here in our beloved New York City, on a two-day shoot (with a scout day in advance of the shoot itself). Our NYC crew — which consisted of a camera operator (DP) and camera assistant — kept things a-movin’ on the Sony FS7, as well as a MiniJib we provided for dynamic shots. Our DP brought things up to a whole new level, capturing some shots holding the FS7 without any support; for other shots he wore an EasyRig, which provided more stability while still lending a handheld feel. Then things really got moving — quite literally so! — with the use of a rickshaw (yes, a rickshaw)! With the help of a grip, who operated it like a standard rickshaw, we were able to capture our actor running down the street and towards the camera. 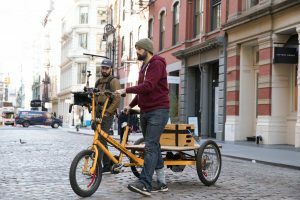 We rigged an apple box to the back of the rickshaw, upon which our DP sat with the aforementioned EasyRig and attached FS7. The video is still making its way through the editing process, so stay tuned to this space for the release of the final product. Like motivation itself, patience is a virtue — and we promise, it’ll be worth the wait!